Marrakech is undoubtedly one of the most mesmerising cities in the world, filled with sights, scents and colour. Work your way through its fascinating neighbourhoods, past its breathtaking architecture, sampling its culinary wonders and discovering its must-do attractions. Morocco’s fabled ‘Rose City’ is a mesmerising metropolis fringed by rolling desert, oasis-like palmeries and the snow-capped Atlas Mountains. 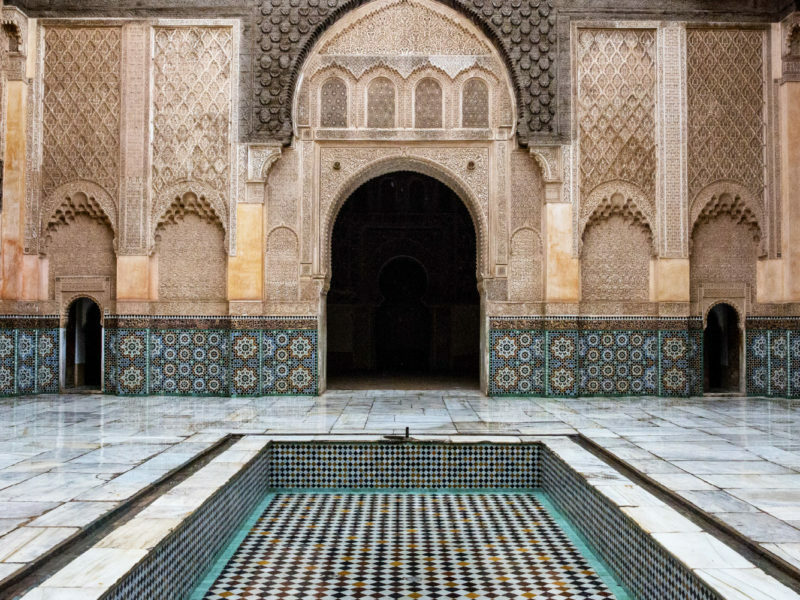 Marrakech’s rich heritage dates back nearly a thousand years; what was once an old caravan town along the sub-Saharan trading routes flourished into one of the great cities of the Maghreb. Nowadays the blush-pink ramparts, soaring minarets and medieval-plan medina are a constant reminder of the imperial city’s storied past. Artists, writers and musicians have long been seduced by Morocco’s ‘Jewel of the South’. Travellers find themselves entranced by the heady atmosphere, riot of colours and chaotic collision of Berber, Arabic and French cultures that lay the foundations of modern Marrakech. Design lovers will delight in the blend of ancient artistry and today’s thriving creative scene that makes up the very fabric of the city. Iconic French fashion designer and former resident Yves Saint Laurent famously said, “A visit to Marrakech was a great shock to me. The city taught me colour”. Whilst the maze-like medina, with its tangle of alleyways and bustling souks might overwhelm the senses – one can just as easily find respite in the secret rose-scented gardens, the pools of palatial hotels and terrace cafes with sweeping views over rose-tinted rooftops, palm trees and Moorish architecture set against a bright blue sky. So if you feel the allure of the exotic, chaotic and utterly enchanting Marrakech, here’s our guide to finding the magic among the mayhem. Qatar Airways flies from Sydney, Melbourne or Perth to Marrakech via Doha and Casablanca. Avoid the scorching summer. Visit in spring (mid-March to May) when the roses are in bloom in Morocco, or enjoy a mild autumn (from September to November). This is the Marrakech conjured up in everyone’s imagination. Getting lost in the labyrinthine alleyways is all part of the experience. The 11th-century, UNESCO-listed old town is surrounded by 16 kilometres of rammed-earth walls. Once you venture inside one of the city’s grand gates it feels like you’ve stepped back in time. While the dusty, narrow backstreets are mostly for foot traffic, make way for pack-laden donkeys and buzzing motorcycles. Shopping for Berber rugs is a must in the souks. The souks (markets) have barely changed in centuries. Souk Semmarine, the main artery that runs through the medina, is piled high with pottery, fabrics, carpets, leatherwork and antiques. As you delve deeper into the vibrant bazaar you’ll witness workmen noisily plying their trade in the blacksmith’s quarter, the dyers’ souk strung with richly coloured skeins of wool, stalls spilling over with leatherwork and handcrafted carpets as well as the Spice Square heavily perfumed with the scent of amber, musk and orange blossom. You’ll probably hear the carnivalesque Djemaa el Fna before you see it (hint: follow the drumbeats and Gnawa music). It’s the pounding heart of the medina, brought to life at dusk as hundreds of makeshift stalls are spread across the historic square and locals gather for an evening out. During the French protectorate in the 20th century, the ‘New Town’ was built adjacent to the medina. The wide boulevards lined with tangerine trees, European bistros and Art Deco buildings are in stark contrast to the old town. The Gueliz district is the locale for high-end restaurants, expensive boutiques and numerous art galleries, whilst the upmarket Hivernage, on the western edge of the medina, is where you’ll find the ultra-luxe hotels such as La Mamounia and the Royal Mansour. The separate 15th-century quarter is where the Jewish community once resided. Remnants of its Jewish history are the Miaara Jewish Cemetery and a few remaining synagogues. Bab Agnaou is one of the most impressive gateways into the old citadel. The medina’s southern district is known for its stately Saadian architecture and arty cafes. Secure yourself a spot on the terrace of Le Grand Balcon du Café Glacier as the sun begins to set. Order a pot of Moroccan mint tea (a sweet amber-coloured tea made with fresh mint and sugar) and sit back to watch the open-air theatre unfold in the famous square below. There’s a dizzying spectacle of soothsayers, snake charmers, magicians, fire-eaters, drumbeat dancers, airborne acrobats and mischievous monkeys performing tricks. Learn how to make a tasty tagine, as well as other local favourites at La Maison Arabe’s cooking school. The half-day workshops are run by the historic riad, which was the first in Marrakech to open a restaurant for foreigners and entertained notable guests such as Winston Churchill, Charles de Gaulle and Jackie Kennedy. Your efforts will be rewarded at the end of class when you get to tuck into a feast of Moroccan flavours in the elegant dining room. The workshop costs around $88 per person. 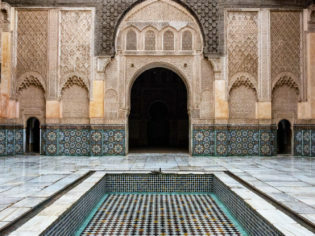 A hammam (bathhouse) is a unique Moroccan cleansing and purifying ritual. For first timers, it’s advised to visit a hammam tailored to tourists. Splurge on a spa day at the splendid Royal Mansour, even if it’s just to see the other-worldly, white-laced interiors. Opt for the 75-minute signature treatment. Marrakech’s headline-grabbing attraction opened its doors in 2017. The museum is dedicated to the life and work of celebrated French fashion designer Yves Saint Laurent. The building has a wow factor of its own – curvaceous lines, intricate lace-like brickwork, as well as an earthy terrazzo and terracotta facade. The small but fascinating museum located inside Jacques Majorelle’s former studio is a great introduction to Berber history and culture. The space exhibits over 600 Berber and North African objects collected by Yves Saint Laurent and his partner, Pierre Bergé. The former fondouk (merchant warehouse) has been repurposed into a gallery for vintage photography. Beautifully curated exhibitions showcase Morocco through the nostalgic lens of the past. Located deep within the Kasbah district Café Clock is as much a cultural hub as it is a cafe. Events include hikayat (traditional storytelling) evenings and Berber-style music and dancing. If you do stop by for lunch, order the legendary camel burger. The recently renovated Le Jardin Secret has opened its doors to the public. It’s a true sanctuary in the Moussaine district of the medina. Find shade beneath the elaborate pavilion, take a stroll through the palatial grounds and admire the gardens brimming with lavender and fruit trees – olive, pomegranate, fig and date to name a few. There’s an admission fee of about $7 for the gardens. The botanical oasis dreamt up by French painter Jacques Majorelle is a must-visit for fashionistas as the iconic blue villa later became the home of Yves Saint Laurent and Pierre Bergé. The couple found inspiration in the dreamy setting, where whimsical grounds are bursting with vivid bougainvillea, bamboo pathways and lofty cacti. Inside the Jardin Majorelle, with its signature blue villa. A charming hotel favoured by glamorous jet-setter types, Beldi Country Club is a mere 15 minutes away from the city centre on the outskirts of Marrakech. Here you’ll uncover an eco-chic paradise – a sprawling five-hectare retreat with swimming pools, ancient olive trees, rose gardens and a glorious greenhouse. Travellers have no trouble parting with their dirhams in this city. After your first spin around the souks, you’re likely to have walked away with a Berber rug under your arm and a pair of butter-soft babouche (leather slippers) on your feet. Once you’ve exhausted the souks, here are some worthwhile retail alternatives. Leave room in your luggage. In fact, bring an empty suitcase! A hip galleria-style shopping spot with boutiques sandwiched among the traditional souks. The stores are located in Mouassine neighbourhood, a somewhat up-and-coming design district within the medina. It won’t surprise you to know that two very stylish Parisian women are behind this contemporary store in the heart of the medina; it sells pottery, tableware, decorative objects and fashion accessories. This long-standing emporium is a treasure trove of beautiful Moroccan pieces; from intricate lamps, quality carpets to larger furniture. A high-end boutique in Gueliz run by Israeli designer Artsi Ifrah who lives and works in Marrakech making one-of-a-kind pieces from vintage fabrics. Visit the scattered ruins of a Saadian sultan’s 16th-century palace. The grand scale of the complex hints at El Badi Palace’s former glory, meanwhile beauty can still be found in the shimmering pools and sunken gardens. Said to be the only remains of the Saadian dynasty that ruled over Marrakech during the golden age of 1524–1659. Impressively laid with Carrara marble and decorative plasterwork, the extravagantly embellished tombs were long forgotten until they were rediscovered in 1917. A riad is a centuries-old Moroccan mansion transformed into a guesthouse, typically with an interior courtyard. Marrakech is the mecca of Morocco’s hip riad scene, with hundreds of atmospheric and often very affordable lodgings in the heart of the ancient medina. Hidden behind nondescript doors, many riads vaunt lush gardens, idyllic pools and sun-soaked rooftop terraces. This eye-catching riad is luxuriously outfitted by Vanessa Branson (sister of Richard Branson) and Howell James. El Fenn remains a perennial favourite for aesthetes as each corner of this exquisite guesthouse pops with jewel-like colours and contemporary art. The passion project of British designer Jasper Conran, where guests sleep in luxe salons, each with a four-poster bed. The swoon-worthy interiors recall the glamour of the 1930s and boast Conran’s own personal collection of antiques. Talented Belgian tastemaker and textile designer Valérie Barkowski transformed her Marrakech residence (formerly a 17th-century townhouse) into an intimate guesthouse. A sophisticated monochrome palette of black and smoky-grey is set against a bright, white backdrop. If you don’t mind sharing the sun loungers with a few posing Instagram influencers, taking a dip in this picture-perfect plunge pool is one of the perks of staying at Riad Yasmine. As the name suggests this is a peaceful haven, cleverly concealed behind heavy cedar doors. It’s owned and run by former French fashion duo Cyrielle and Julien, and while the saffron-yellow tadelakt (plastered) walls, stucco arches and filigree balustrades all impress, it’s the lush courtyard that makes it truly special. This six-room riad is a design-enthusiast’s dream, with individually bedecked rooms that combine mid-century minimalism with Moroccan style. Plus, it has Philippe Starck-designed bathrooms, a heated outdoor pool and a bougainvillea-draped courtyard. This 14th-century masterpiece was once the largest Qur’anic school in North Africa. It remains one of the finest examples of Arabic architecture in Marrakech. While non-Muslims are not allowed to enter mosques in Morocco, you can admire the towering minaret from across the city and listen as the muezzin’s call to prayer echoes throughout the walls of the medina. The opulent 19th-century palace was once home to the harem of notorious vizier Abu ‘Bou’ Ahmed, with sumptuous rooms for his four wives and 24 concubines. Exceptional examples of Moroccan craftsmanship can be admired in the details here.